We have thousands of properties for sale all over France. But we've no property for sale in Binic at the moment. And that's something we want to change. If you have a property to sell in Binic (or nearby) then act now to get a 50% discount. Just place your advert in the normal way (Click here to place your advert). Then send us an email quoting "Binic" and telling us that you you saw this offer. Binic is a beautiful little fishing town lying on the picturesque northern coast of Brittany. The town is considered to be one of Brittany's most beautiful, set as it is on the glorious coast, facing out towards the Channel Islands. Binic is characterised by its pretty harbour, where a flotilla of small boats, fishing boats and pleasure craft can always be seen, adding a cheerful splash of colour to the already picture postcard scene. And as it gazes out to sea from its attractive harbour, it seems to be dreaming of days gone by. The harbour is lined by tall, elegant houses which were once the homes of the wealthy ship-owners, and it is hard to stand here without gaining a very real sense of life in the mid-nineteenth century, when Binic was an important cod fishing port. Binic, with its interesting collection of shops, selling local goods and crafts as well as the more mundane things of life, offers something to please everyone, from adrenaline junkies can revel in water sports such as speed sailing, to walkers who can indulge their hobby amidst some of France's most lovely seascapes. The little town has a good selection of restaurants too, so you can enjoy sampling the freshest fish around, in authentic style! Binic is a great location for families, whether as a holiday destination or as a permanent home. The town has no less than three beaches, whose sheltered, fine silver sands are perfect for family fun. There are swimming pools, tennis courts, an eighteen-hole golf course, an art and popular traditions museum, boat trips to the nearby island of Brehat, superb walking, cycling and horse-riding trails, not to mention the fabulous cod festival in May! Getting to Binic couldn't be easier. The town lies very near to the ferry port of St-Malo, so the most obvious route from the UK would be to catch a ferry to this port. It is also quite feasible to travel to Caen or Cherbourg, which allows more options and a chance to find cheap fares. Air travel is possible too, with Ryanair, the low cost airline, operating flights between Dinard, the Breton airport, and Stansted or East Midlands airports in the UK. Finally, you could choose to take Eurostar to Paris, then change to a train taking you to the station at the neighbouring town of St. Brieuc. 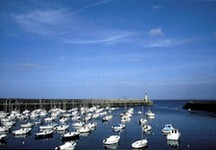 Brittany is, and has long been, a popular choice with British property seekers. The region's combination of spectacular scenery, sunshine and proximity to the UK ensures that property here will always be sought after and therefore will never be the cheapest in France. Binic, being on the coast, is one of the pricier parts of the Côtes-D'Armor, but the benefits of buying here are many. Breton coastal property may be initially expensive, but it holds its value well, and should see significant increases still, if recent trends are to continue. The other factor to take into account is rental potential. Binic is a very popular holiday town, so property here should benefit from a high rental income. Do you know Binic better than we do? Do you have photos of Binic? Binic is found in north-west France, on the northern coast of Brittany's Côtes-D'Armor department. Access: By air: Fly to Dinard with Ryanair. By rail: Take Eurostar to Paris from London, and then catch a train to St.Brieuc. By boat: Binic is very close to St. Malo port, which has several crossings to and from the UK. Economy: Historically, Binic was an important cod fishing port, but in recent times the main source of income probably stems from tourism. Interesting fact: Binic celebrates its long history of cod fishing with a festival, the Fête de la Morue, held every May in the town. This involves music, dancing and? seafood!